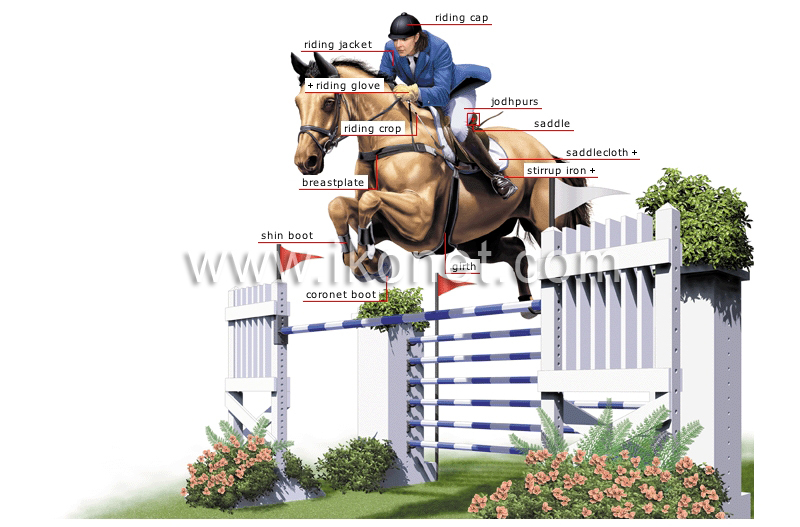 Person riding a horse; during a jump, the rider leans toward the horse’s neck with the feet supported by the stirrups. Usually rubber item of equipment that covers the horse’s hoof to prevent injury. Strap around the horse’s chest that prevents the saddle from sliding back. Reinforced hat that is traditionally covered with black velvet; it protects the rider’s head against impact. Thin flexible stick that the rider uses to spur on the horse. Equipment placed around the cannon of the horse’s leg to protect it from injury. Padded part that is placed under the saddle to protect the horse’s back from chafing; it also protects the saddle from the horse’s sweat. Covering for the hand and wrist that takes the shape of the fingers; it provides a good grip on the reins and protects the hands from chafing. Usually light-colored long pants that are very tight over the knees and legs and are kept stretched by foot straps. The rider’s long dark-colored jacket; it is usually worn over a white shirt and a white tie.